Offering free things to your website visitors is one marketing method that often results in a lot of sales. Free courses that are delivered via email are very popular and people sign up for such courses on a regular basis to learn more about a topic of interest to them. These courses are best maintained and delivered with the use of autoresponders. Well really anything imaginable can be done as an eCourse. The success of an eCourse is assured as it deals with one problem and one solution. You might buy a marketing course that includes everything imaginable but, for example, you just want some tips to build your list. We live in an era of information overload, so short and to the point is the best way to go. 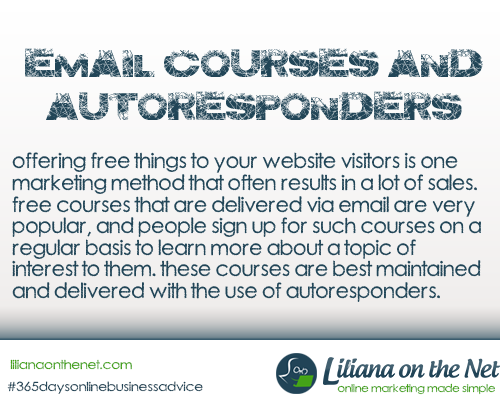 An autoresponder can be set up to send out a series of lessons for an email course. The lessons can be set for distribution at specific intervals. You determine how often the lessons for the course are sent to the people who have signed up for it. eCourses are very different from traditional courses, web based courses or any other type of course. There is no student and instructor interaction. The instructor writes the information out, puts each lesson in an autoresponder series, sets the timing for the lessons and the rest is automated. You can opt to have lessons delivered daily, every other day, every three days or any other time frame that you think works best for your email students. Start by determining what your course will be about and how long it should be. If the course should be delivered every other day for two weeks, you know that you would need seven lessons. Write the lessons, and load them in the autoresponder. Set the interval for each lesson, which in this case would be 1, 3, 5, 7, 9, 11 and 13. This means that the first lesson would be delivered one day after the person has requested the course and the second lesson would be delivered three days after the person has requested the course and so on. The interval for each lesson is set for the number of days after the person has signed up. Make sure that everything is spelt correctly and that your sentences are grammatically correct. You want the lessons to look and sound as professional as possible. Article writing to market your blog, products or services is an excellent way to build your business. Articles that are written for promotion normally contain a link to the website or the product or service that you are marketing. Also you can include an author box with more details about yourself. These promotional articles are normally submitted to article directories, ezine publishers and article banks. It is a well known form of traffic generation but this is even more effective when combined with an autoresponder. Set up each article on your autoresponder. It is important that each article has its own autoresponder address. Aweber allows for this. Check your autoresponder. Make a master list of your articles with the autoresponder address for each article beside the title. You could even write descriptions for each article in your master list. You can promote your link to the master list. It won’t take as much time as promoting each individual article. Include this link in your blog/website and for maximum exposure, allow other marketers to use this as a free resource for their subscribers. I don’t know about you, but I own over 200,000 PLR articles on every topic and niche you can imagine. I use my favorite article spinner for ideas how to re-write them. I use the articles, not fully spun but with the synonyms to give me ideas how to change the PLR articles. They are very good quality articles. 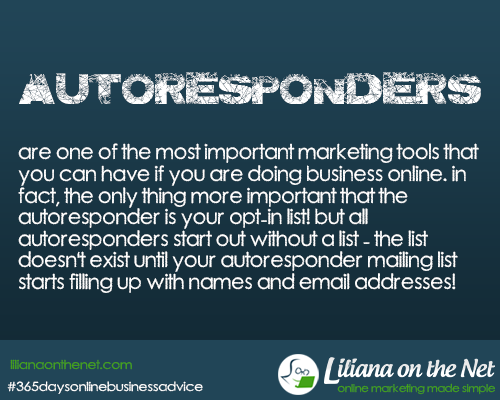 Autoresponders are an essential marketing tool that you need if you are doing business online. If you have been in online marketing, I am sure, you would have heard of the term: “the money is on the list”. Remember all autoresponders start without a list, it is up to you and your efforts for your mailing list to start filling up with names and email addresses. One of the quickest ways to build your mailing list is to give away things for free. Some marketers, those probably with large lists, think this is a waste of time. Believe me it is the easiest and fastest way for a newbie. Don’t think it is a waste of income but as an investment for your future profits. anything you can think of, including services. Your objective is for people to sign up to receive the freebie and by signing up they are agreeing to receive your emails in the future. It is a win-win situation for both parties, they receive the item they want and you acquire a new prospect. The freebie itself gives you the opportunity to promote your products and services. Even just affiliate links to the products related to the freebies generates extra revenue. You also have the opportunity to email in the future your products and services. You always have to add value, not just promote. If you don’t give your list a reason for continuing receiving emails by providing value, not just promotions, they won’t stay signed in to your list. To succeed you must use all what is available in the world of Internet Marketing. by providing value and free advice in future emails you have weekly or monthly opportunities to earn more money. You must not waste these opportunities so remember you must put your marketing in automatic mode and use an autoresponder. I use what is termed as the industry standard. You can start with a $1 trial.